A child who presents to the emergency department with an altered level of consciousness can be clinically unstable and can pose a great diagnostic challenge. The emergency clinician must quickly develop a wide differential of possible etiologies in order to administer potentially life-saving medications or interventions. The history, physical examination, and appropriate diagnostic tests can aid greatly in rapidly narrowing the differential diagnosis. Once initial stabilization, workup, and first-line interventions are completed, most patients who present with unresolved or unidentified altered level of consciousness should be admitted for further evaluation and close monitoring. This issue provides a review of the etiologies of altered level of consciousness as well as guidance for the management and disposition of patients with this condition. Altered level of consciousness (ALOC) has an extensive differential diagnosis, and mnemonics such as “AEIOUTIPS” and “MOVESTUPID” can assist providers in recalling potential etiologies. Hyponatremia usually presents with seizures and should be corrected slowly, with a goal of correction of 12 to 15 mEq/L (12-15 mmol/L) over a 24-hour period. Bedside tests (eg, point-of-care glucose and venous blood gas with electrolytes) may quickly reveal easily reversible causes of ALOC. The GCS has been shown to have a statistical correlation with a broad array of adverse neurologic outcomes, including brain injury, need for neurosurgery, and mortality. The GCS score has been incorporated into numerous guidelines and assessment scores (eg, Advanced Cardiac Life Support, Advanced Trauma Life Support, Acute Physiology and Chronic Health Evaluation I-III, the Trauma and Injury Severity Score, and the World Federation of Neurologic Surgeons Subarachnoid Hemorrhage Grading Scale). Correlation with outcome and severity is most accurate when applied to an individual patient over time; the patient’s trend is important. A GCS score of 8 should not be used in isolation to determine whether or not to intubate a patient but does suggest a level of obtundation that should be evaluated carefully. Reproducibility of the GCS score can be low; if individual institutions have concerns about an agreement between providers, training and education are available online from the GCS creators at www.glasgowcomascale.org. Simpler scores that have been shown to perform as well as the GCS in the prehospital and emergency department setting (for initial evaluation); these are often contracted versions of the GCS itself. For example, the Simplified Motor Score (SMS) uses the motor portion of the GCS only. THE SMS and other contracted scores are less well studied than the GCS for outcomes like long-term mortality, and the GCS has been studied as trended over time, while the SMS has not. 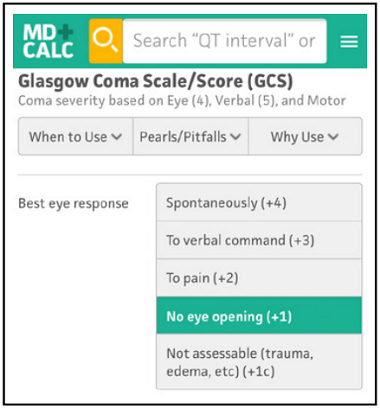 The Glasgow Coma Scale (GCS) is an adopted standard for mental status assessment in the acutely ill trauma and nontrauma patient and assists with predictions of neurological outcomes (complications, impaired recovery) and mortality. A declining GCS score is concerning in any setting and should prompt airway assessment and possible intervention. If a trauma patient has a GCS score < 8 and there is clinical concern that the patient is unable to protect his/her airway or there is an expected worsening clinical course based on exam or imaging findings, then intubation can be considered. The Modified Glasgow Coma Scale (the 15-point scale that has been widely adopted, including by the original unit in Glasgow, as opposed to the 14-point original GCS Scale score) was developed to be used in a repeated manner in the inpatient setting to assess and communicate changes in mental status and to measure the duration of coma (Teasdale 1974). In the acute care setting, the GCS has been shown to have highly variable reproducibility and inter-rater reliability (ie, 56% among neurosurgeons in 1 study, 38% among emergency department physicians in another). In its most common usage, the 3 sections of the scale are often combined to provide a summary of severity. The authors themselves have explicitly objected to the score being used in this way, and analysis has shown that patients with the same total score can have huge variations in outcomes, specifically mortality. A GCS score of 4 predicts a mortality rate of 48% if calculated 1 + 1 + 2 for eye, verbal, and motor components, and a mortality rate of 27% if calculated 1 + 2 + 1, but a mortality rate of only 19% if calculated 2 + 1 + 1 (Healey 2014). In summary, the Modified Glasgow Coma Scale provides an almost universally accepted method of assessing patients with acute brain damage. Summation of its components into a single overall score results in information loss and provides only a rough guide to severity. In some circumstances, such as early triage of severe injuries, assessment of only a contracted version of the motor component of the scale, as in the SMS, can perform as well as the GCS and is significantly less complicated. However, the SMS may be less informative in patients with lesser injuries. Teasdale G, Jennett B. Assessment of coma and impaired consciousness. A practical scale. Lancet. 1974;2(7872):81-84. Moore L, Lavoie A, Camden S, et al. Statistical validation of the Glasgow Coma Score. J Trauma. 2006;60(6):1238-1243; discussion 1243-1244. Teasdale G, Jennett B. Assessment of coma and severity of brain damage. Anesthesiology. 1978;49(3):225-226. Teasdale G, Jennett B, Murray L, et al. Glasgow coma scale: to sum or not to sum. Lancet. 1983;2(8351):678. Healey C, Osler TM, Rogers FB, et al. Improving the Glasgow Coma Scale score: motor score alone is a better predictor. J Trauma. 2003;54(4):671-678; discussion 678- 680. Green SM. Cheerio, laddie! Bidding farewell to the Glasgow Coma Scale. Ann Emerg Med. 2011;58(5):427-430. Middleton PM. Practical use of the Glasgow Coma Scale; a comprehensive narrative review of GCS methodology. Australas Emerg Nurs J. 2012;15(3):170-183. Yeh DD. Glasgow Coma Scale 40 years later: in need of recalibration? JAMA Surg. 2014;149(7):734. Teasdale G. Forty years on: updating the Glasgow Coma Scale. Nurs Times. 2014;110(42):12-16. Gill M, Windemuth R, Steele R, et al. A comparison of the Glasgow Coma Scale score to simplified alternative scores for the prediction of traumatic brain injury outcomes. Ann Emerg Med. 2005;45(1):37-42. Haukoos JS, Gill MR, Rabon RE, et al. Validation of the Simplified Motor Score for the prediction of brain injury outcomes after trauma. Ann Emerg Med. 2007;50(1):18-24. Thompson DO, Hurtado TR, Liao MM, et al. Validation of the Simplified Motor Score in the out-of-hospital setting for the prediction of outcomes after traumatic brain injury. Ann Emerg Med. 2011;58(5):417-425. Access the the Revised Trauma Score. Evaluate and manage patients with altered levels of consciousness in the emergency department. Date of Original Release: January 1, 2016. Date of most recent review: December 15, 2016. Termination date: January 1, 2019. Faculty Disclosure: It is the policy of EB Medicine to ensure objectivity, balance, independence, transparency, and scientific rigor in all CME-sponsored educational activities. All faculty participating in the planning or implementation of a sponsored activity are expected to disclose to the audience any relevant financial relationships and to assist in resolving any conflict of interest that may arise from the relationship. Presenters must also make a meaningful disclosure to the audience of their discussions of unlabeled or unapproved drugs or devices. In compliance with all ACCME Essentials, Standards, and Guidelines, all faculty for this CME activity were asked to complete a full disclosure statement. The information received is as follows: Dr. Song, Dr. Wang, Dr. Cantor, Dr. Rose,Dr. Vella, Dr. Damilini, and their related parties report no significant financial interest orother relationship with the manufacturer(s) of any commercial product(s) discussed in this educational presentation.